What could go wrong when you find perfect husband for your stepsister? 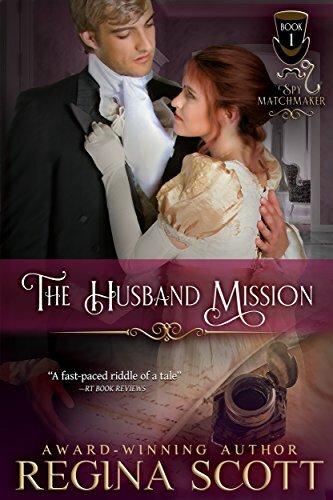 The Husband Mission is a sweet, fun read. Great characters, some simply adorable scenes (“Places!”), and several quirky, endearing characters. Katherine (“the Colonel”) picks out the perfect husband, Lord Borin, for her stepsister, Constance. If Constance doesn’t marry in the next six weeks, she will lose her fortune to a nasty piece of work. Of course, there’s only one problem with picking out the perfect husband for someone else… you might live to regret it. If you enjoy clean regency romances and sweet love stories, this one’s for you. I’ll definitely be reading more by Regina Scott. Katherine Collins is on a mission. With no means and few prospects, the spirited spinster is financially beholden to her stepsister Constance, who stands to inherit a large fortune–if she marries in the next six weeks. What better than to present Constance with the perfect husband, Alexander Wescott, Lord Borin? After all, Katherine has been spying on the handsome, wealthy viscount, just to make sure he’s the man she hopes.